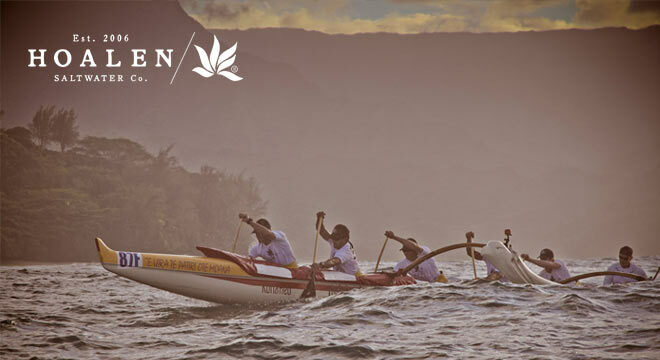 New York Outrigger is proud to announce Hoalen as a Krevey Level Sponsor for the 2016 Hawaiian Airlines Liberty Challenge. We searched for a long time and eventually uncovered this word, originally from the French Brittany’s dialect, but with an almost universal pronunciation. Hoalen means “sea salt” in the old Breton language. This six fingered seaweed, that we drew and designed, lying under water, is a strong symbol of the traditional culture from this region of seaweed gatherers that the French call “goémoniers”. This name and logo embodies our adventure since 2006, the date when Hoalen was born on the coast of North Finistere. We are geared towards adults because, as adults ourselves, we expect more from a surf and lifestyle environment brand than we once did as teenagers. Through Hoalen, we strive to bring these adults, professionals or amateurs of swell sports, whom we call “Saltwater Players”, together. We create for them clothing strongly inspired by the sporting world, but freed from the fleeting trappings of the fashion world, with easy to wear classic cuts and discreet branding. We choose heavy cotton garments that we wash until they get the soft hand feel we are aiming for. We are inspired by old school designs, from the beginnings of surf culture on the Australian and Californian shores. Our clients are men and women, and we also adapt some pieces of our collection for kids. In the future we will produce locally in Brittany, but up until now we have been working closely with the same small factory in the south of India. For polyester, nylon and wool, we have developed specific partnerships in China and Bulgaria. We give priority to emulation over competition. In a universe where most of the sports brands communicate mainly through contests and professional athletes, we try to reshape the rules and adopt new codes, where values and style are more important than strict performance. This has brought to us exceptional men and women, sport icons and experienced watermen, who share a common passion for making the sea their playground and the shore their home ground, on French, Japanese, Spanish and Ecuadorian coasts. They are our ambassadors. They not only trust the brand with their image but, more importantly, accompany Hoalen along in our development. Mahalo to @HOALEN for their continued support of the @HawaiianAir #LibertyChallenge!